This page is generated by Machine Translation from Japanese. The last timeIntroduction chapterSo, how to build open-source full-text search server by Fess introduced. 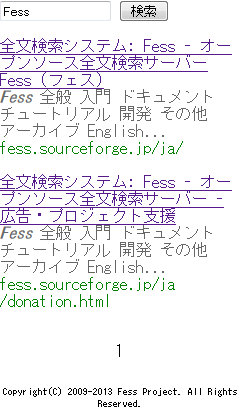 Fess on docomo, au and Softbank Mobile search so that introduce how to use this time. In this article, explains Fess 8.1.0. About how to build a Fess Introduction chapterPlease see the. Regarding the content of this article in the following environment and behavior verification. Available for mobile terminals in the full-text search system for systematically following such response will become necessary. In the Fess corresponds to all of the above. For processing first, retrieving the phonemobyletIs adopted. mobylet is a Java open source framework for building mobile Web applications. 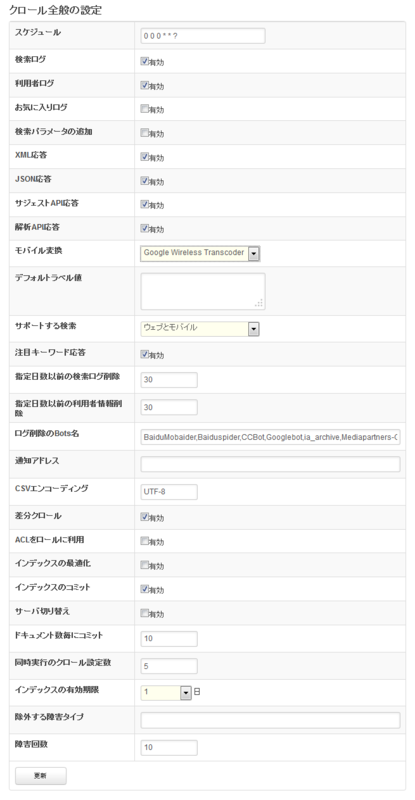 You can view the results mobylet in docomo, au and Softbank handsets to identify the appropriate terminals each. You can with Web crawl settings set the user agent when the next crawl search in Fess . You can crawl the user agent for career, to get their sites for mobile phones. However, you must allow Fess server IP you are IP restrictions for mobile site, mobile phone sites displaying. Also, viewable results carrier terminal only in select the carriers you want to display all selected Web crawl settings in the default [browser], but that becomes possible. (If you use the PC site Viewer, such as can be viewed is) cannot normally see on mobile devices even if the search result Web-site, PC site link appears in the search results. It is possible to use the Google Wireless Transcoder in Fess . Google Wireless Transcoder is a service provided by Google, Inc., PC site will convert your various mobile phone. It is possible for simple settings in Fess , links Google Wireless Transcoder to convert search results the search results use smooth PC site. Fess 8.1.0 installed and is running. create a Web crawl settings to display the search results only if you searched for DoCoMo handsets. Access and http://localhost:8080/fess/admin in the management page, please login. By default user name and password are both admin. Select the [Web] from the left of the admin page. For anything not registered in the initial state, select Create new. This time the mobile phone site is not that will crawl all the pages of https://fess.codelibs.org/ja/ following. any mobile sites that can be displayed in DoCoMo handsets instead of https://fess.codelibs.org/ja/ the site URL specifies. 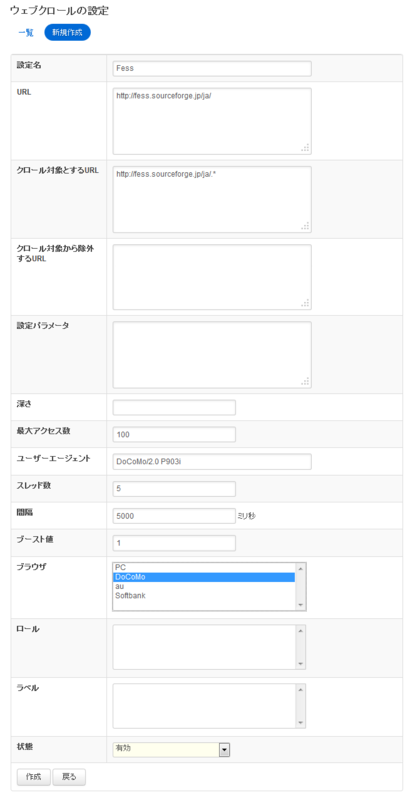 [Browser] and select only the DoCoMo so that appears only in docomo handsets. If you want to display in AU and Softbank handset select them here. After the user agent be user-agent for docomo handsets. This time we enter DoCoMo/2.0 P903i. 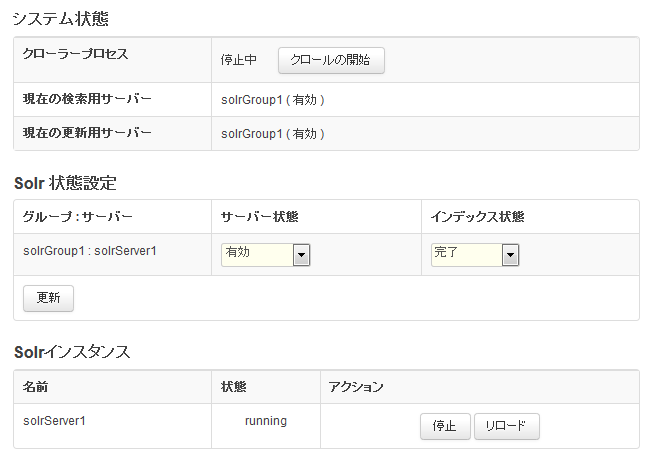 Then, click the [create] on the confirmation screen that can crawl to register. Registration is possible to change from the Edit. Sets the search results PC if there is Google Wireless Transcoder available sites you like. Excluding the PC site to search for the mobile site is just there if you don’t need this setting. Select the crawl General from the left of the admin page. In the mobile conversion, select the Google Wireless Transcoder. Saves the settings and click [update]. Mobile handset settings after the start to crawl, create a searchable index. Select the system settings from the left of the admin page. Click the start crawling, initiates a search for crawling and indexing. While complete crawl. First, try searching in the PC browser, such as Internet Explorer. visit http://localhost:8080/ Fess , locate the Fess . You can: set Web crawl settings in the PC browser in search results is displayed. The following access in docomo handsets. This time real terminal, not in FirefoxFireMobileSimulatorUse Add-ons, to see the results. FireMobileSimulator is a Firefox Add-on that simulates the major three carriers mobile phone browser. FireMobileSimulator installed in Firefox, from the Firefox menu select, DC Terminal docomo P903i from [tool] [FireMobileSimulator]. When you access this setting allows Firefox to simulate the P903i handset environment. Similarly if the PC browser and visit http://localhost:8080/fess, locate the Fess . Search for this time is specified in the Web crawl settings is displayed. How to respond to the Fess in the full-text search system handsets introduced. I could introduce you can provide search functionality to the handsets of three major carriers in simple settings. Also, it is possible to respond by phone will be released new models on a regular basis, but the latest terminal information file in Fess ‘webapps/fess/WEB-INF/classes/device’. About how to update the device information file see the README in the directory. Next switch to display results search results depending on authentication of users, roles functions are introduced here.